We were up before 8am, showered and had breakfast at the hotel before checking out. We left our luggage at reception and hopped on the scooter. Lots of exploring today! 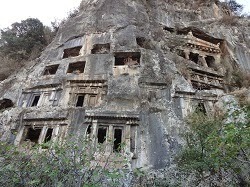 By chance we passed the Lycian Tombs carved into the side of the mountain (in 350BC apparently!) (we had planned to find our way to them later in the day) and then continued on our way to Kaya Koy, the nearby ghost town. What a gorgeous ride over the mountain thru pine forests (looked like Tokai forest!) ... although we were a little nervous about our scooter's ability on the steep uphills, we managed just fine. Kaya Koy was pretty cool. 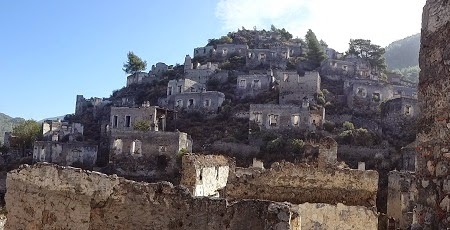 Although, again, it's all Greek houses that were abandoned after the "swap" in the 1920s. What was amazing was going into one that had been preserved. Wow! Read a little online about the whole swap. Sounds like it was all religious #sigh. People do dumb things in the name of religion. I mean who cares what someone else believes? 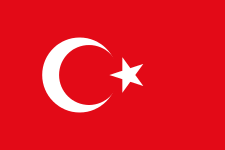 Why do countries even have religions anyway? Should be down to personal choice. Also weird is to think that less than 100 years ago ... how few people were probably openly atheist? Frowned upon, I imagine. I find the whole religion thing quite surreal. 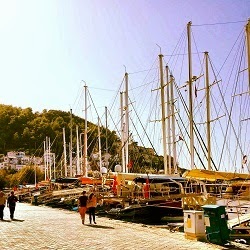 Then we headed back to Fethiye. Took a bit of a ride thru more suburban bits before taking the coastal road back to the city centre. Stopped for BK for lunch haha. And then took a stroll along the harbour side. Such a nice walk. Although I did expect more in the way of beaches. The Trucker decided he needed a beard trim at one of the many barber shops. It is quite amazing to watch these men, such a craft really. And you can't rush them! And then we returned our scooter and collected our bus ticket and our laundry and returned to our hotel to wait for our transfer to the bus station at 4pm. Our bus to Denizli left at 16h30 and our itinerary said it'd be an approx 3 hour trip. But I doubt it ever is ... ours took 4.5hrs. So instead of arriving at 19h30, in time to get some dinner, we arrived at 9pm. And then struggled to find our hotel transfer. They said sorry, no one had phoned to confirm what time :/ Urgh, so we grabbed a quick toasted sarmie at the big Denizli Bus Station and then grabbed a local bus to Pamukkale. We arrived at our hotel around 10pm.